The Soviet Union comprehensively governed the mobility of its citizens by barring emigration and strictly regulating internal migration. In the aftermath of the Soviet collapse, the constitution and laws of the new Russian Federation appeared to herald a complete break with the repressiveness of the previous government. Russian law now proclaims the right of Russian citizens and residents to move around their country freely. 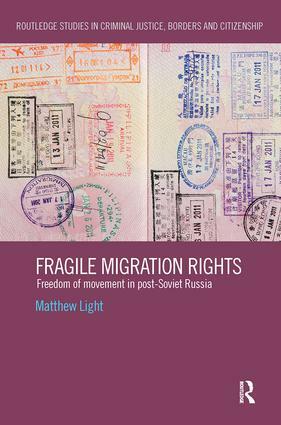 This book examines how and why this post-Soviet legal promise of internal freedom of movement has been undermined in practice by both federal and regional policies. It thereby adds a new dimension to scholarly understanding of the nature of rights, citizenship, and law enforcement in contemporary Russia. Most contemporary works focus on the attempts of developed Northern countries to regulate migration from the global South to the global North: here Matthew Light examines the restriction of migration within Soviet and post-Soviet Russia, providing a comprehensive view into an area rarely explored within migration scholarship. Fragile Migration Rights develops a comprehensive theoretical framework to analyse this complex subject. It is essential reading for students and academics from a range of disciplines including criminology, human rights, migration studies, and political science. Migration controls in the Soviet Union: Prohibition, management, or sponsorship? Belgorod Oblast: Migration policy model for Russia?